[5-11-2018] Illustrated Kairi [EX] and Illustrated Xion [EX] are back! Illustrated Kairi and Illustrated Xion are making their return! Guaranteed to receive each medal pre-strengthened to 3 Special Attack Dots within 5 draws! Includes one Magic Broom Medal as a bonus each time you draw from either banner. 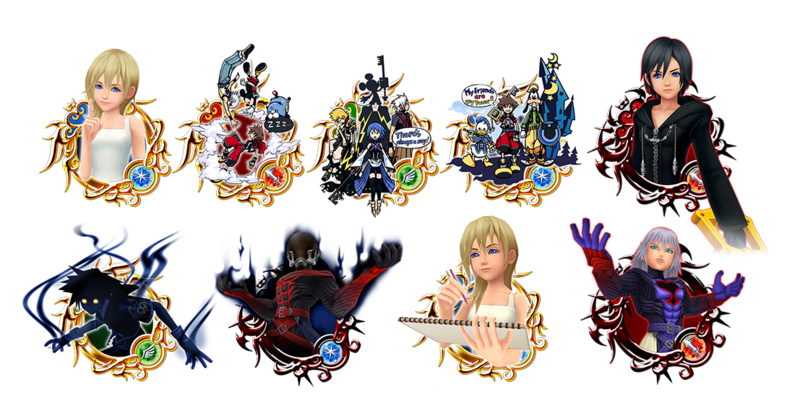 There's also a chance you could receive the Illustrated Xion Medal from the Illustrated Kairi banner or receive an Illustrated Kairi Medal from the Illustrated Xion banner! If you receive the Illustrated Xion Medal from the Illustrated Kairi banner, it will have no impact on the Illustrated Kairi banner counter. If you receive the Illustrated Kairi Medal from the Illustrated Xion banner, it will have no impact on the Illustrated Xion banner counter. Both EX medals have unique Home Screen music when shared. You will receive at least one tier-5 or higher medal pre-strengthened 1-3 special attack dots in each draw. The remaining 9 medals will be 5-star or higher rarity.